In a video streamed live on Facebook on the night of November 20, an army of riot police stand guard as fire hoses blast anti–Dakota Access pipeline activists on a bridge near Standing Rock in the subfreezing cold. Scenes of distress and chaos follow. A breathless medic describes seeing mass hypothermia and severe hand and head injuries from rubber bullets. Two soaking wet young men complain of being gassed with smoke bombs, tear gas, and mace. A man shot in the head by a rubber bullet is bandaged and carted away in a hatchback. People are choking, crying. Helicopters whir overhead. Amid it all, in the shadows broken by police floodlights, elders sing a Lakota prayer song. In that raw video and others from the ground, the all-night mayhem on North Dakota Highway 1806 doesn’t look like a riot. Rather, the longest, largest confrontation between police and direct-action activists since the Standing Rock Sioux Nation’s fight to stop the Dakota Access pipeline (DAPL) caught on in August looks like a siege. Yet local law-enforcement officials still insist otherwise. Amid the siege, in the shadows broken by police floodlights, elders sing a Lakota prayer song. Never mind that the United States phased out the use of fire hoses to quell protests more than 50 years ago. In a seminal story of the black civil-rights struggle in 1963, police trained high-pressure hoses on schoolchildren marching for equality in downtown Birmingham, Alabama. Images of the incident repulsed the nation, so much so, historians say, that they helped usher in the 1964 Civil Rights Act. Similarly, viral videos of DAPL security guards attacking unarmed Standing Rock activists with mace and German Shepherds on September 3 helped fuel the “NoDAPL” movement. But times are radically different post–Election Day. The unprecedented, indigenous-led David-and-Goliath fight to stop the $3.8 billion, 1,172-mile pipeline, set to cross under the Missouri River near the Standing Rock reservation’s water-intake pipes, is facing a new reality that only broad, sustained support can hope to change. It’s also that the daily Trump news, an embarrassment of riches for journalists, threatens to give the Standing Rock stand short shrift on the national stage, allowing local officials hostile to the movement to define it. Yet, rather than highlight this version of events, news stories followed the lead of local authorities, who said they began to use nonlethal force on the crowd only after police were attacked. In the sheriff’s version, protesters with a backhoe bent on removing a blockade on the bridge—two burnt military trucks chained to concrete barriers—set fires and threw logs and rocks at police who responded to the scene. Kirchmeier told reporters that pieces of improvised explosive devices, the kind used by terrorist groups, may have been responsible for Wilansky’s destroyed arm. In the camp’s place, the Army Corps said it would establish “a free speech zone on land south of the Cannonball River for anyone wishing to peaceably protest the Dakota Access Pipeline project, subject to the rules of 36 C.F.R. Part 327.” The Corps couldn’t be reached to respond to the many questions the statement raises, including how big the free speech zone will be, whether it will allow 24 hour a day camping, and what the code mentioned means. But the news came just two days after North Dakota’s three top elected Republicans, including the governor, senator, and sole House Representative urged the Army Corps to allow the pipeline work to go forward. The officials, all GOP faithful who fervently support the pipeline, said law enforcement is investigating cases of butchered, mutilated cattle, horses, and bison in areas adjacent to sites occupied by protesters. These accusations, vehemently denied by Standing Rock activists, have so far produced no evidence or led to any arrests. From the moment, almost, that the Standing Rock resistance became a mass mobilization, with indigenous activists from all over the country converging at a camp overlooking the confluence of the Missouri and Cannonball rivers, North Dakota officials have suggested it was a threat to the community. A week into the pilgrimage, in August, Sheriff Kirchmeier announced that protesters had been spotted with a pipe bomb. The object in question was a chanupa, a sacred pipe. In fact, unless you’re there, it’s easy to forget that the whole stand against the pipeline started back in April as a “spirit camp”—a handful of people—on Standing Rock Sioux Nation land overlooking the Missouri River. They called themselves water protectors and land defenders, watching for signs of construction. Their weapon against backhoes: prayer. The NoDAPL movement’s spiritual underpinnings tend to be overlooked. The fight is usually framed as a NIMBY action. The movement’s spiritual underpinnings tend to be overlooked. The fight is usually framed as a NIMBY action of sorts. Pipeline supporters (including most of North Dakota’s elected officials and a Who’s Who of Wall Street banks) say the pipeline, which would transport up to 600,000 barrels of crude a day from the Bakken oil fields to a terminus in southern Illinois, is safer than the Federal government requires. On the other hand, the story goes, the Standing Rock Sioux Nation worries that construction will desecrate sacred sites on its ancestral lands, and that the pipeline’s crossing under the Missouri River will threaten its water supply. After all, the route originally crossed the Missouri near Bismarck, but was moved over concerns that an oil spill could wreck the capital city’s water. That narrative has stuck, although it is incomplete. It misses the backstory, one that explains why this cause embraced by environmentalists and social-justice champions resonates so profoundly across Indian Country. Indigenous traditional spiritual beliefs propelled the Standing Rock stand and sustain it. Protecting Mother Earth for future generations is inherent to “traditionals,” a given for anyone walking a righteous road. These beliefs explain why thousands of families camped on the ground have given up their daily lives—jobs, school, homes—to stand as “water protectors.” They also explain why campers on the ground today say they plan to stay until they defeat the DAPL, even as their odds have dropped like a rock since November 8. 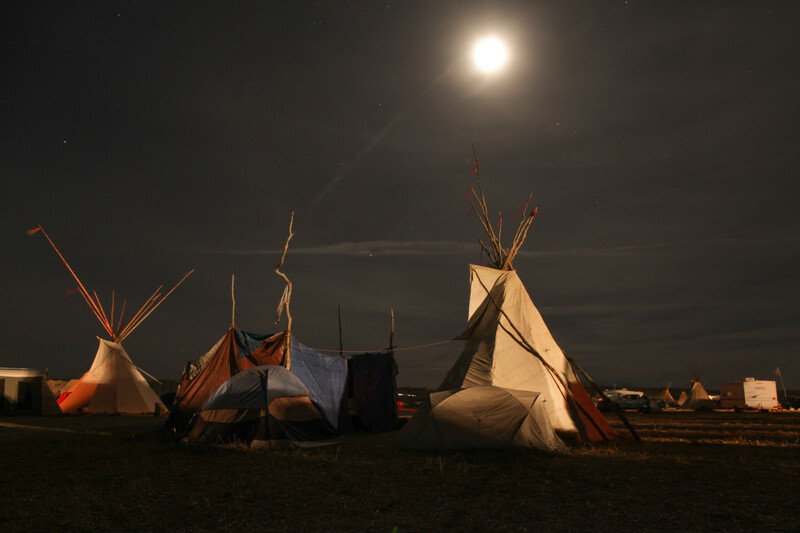 The Standing Rock spirit camp was set up by LaDonna Bravebull Allard, an elder and tribal historian, on her own land. She called it the Camp of the Sacred Stone. She has repeatedly said that the Lakota belief that land and water are sacred to life inspired the camp. The camp stayed small until the threat of the black snake grew. That happened at the end of July, when the Army Corps of Engineers issued most of the final permits for construction. Then, the spirit camp stepped up its fight. It asked for help from the tribes of the Oceti Sakowin, or the Seven Council Fires (commonly, the Great Sioux Nation). By mid-August, hundreds of people from throughout Indian Country had begun making their way to Standing Rock. Among the poorest residents of the United States, many traveled the hard way. Elders hitchhiked for days. A single mother with babies drove 20 hours. Teens organized fund-raisers for bus convoys. Had North Dakota Governor Jack Dalrymple visited the camp before declaring a state of emergency on August 19, which ushered in militarized police reinforcements from six states and 24/7 aerial surveillance, he would have seen what any visitor to the camp saw: a sign, at the entrance, two bedsheets long, that reads: “We Are Unarmed”; women in sewing circles making traditional long skirts (using portable generators to power their machines); volunteers chopping wood for hours for the sacred fire, where prayerful ceremonies are held; teens racing on horseback; signs for Mni Wiconi (Lakota for “Water Is Life”), everywhere. Dalrymple might have also noticed the strict code of conduct, posted in the main camp and reinforced with daily afternoon briefings for all newcomers, that demands respect for all people, bans anything that looks like a weapon, and prohibits alcohol and drugs. The spirit camp has grown into several camps, a stone’s throw from each other. They have a fluctuating population of 3,000 to 4,000 people from hundreds of tribal nations across the Americas and hundreds of non-indigenous allies. Yet prayerful meetings still rule the day. They govern the camps, informing all major decisions. Days later, the governor, who has yet to visit the encampment, said approval of the pipeline was long overdue. He blamed the protests for burdening the state and said the pipeline was an all but done deal. Before the Backwater Bridge bombardment, the Morton County sheriff had issued a statement, with aerial photos, saying the encampments were breaking the law by building illegal structures. He cited concern for the safety of the camp dwellers due to North Dakota’s winter, just as the Army Corps of Engineers eviction notice did. People say their spiritual commitment to sacred water compels them to stay until the end, whatever that might mean. At Oceti Sakowin, which became the main camp when the Sacred Stone camp filled up, people have been making plans to stay a while. They’ve been building tiny houses, insulating tents, and stacking wood. Yurts shipped from Mongolia dot the landscape. The camp’s K–12 school has a new, solid building. The free clothing store, stocked with donations, is handing out thick hats and gloves. The camp, a large open field owned by the Army Corps of Engineers, which has an outpost just below the road into it, is starting to look like a village. It even has a commercial strip. The legal tent, staffed by volunteer human-rights lawyers, sits near the media tent, which is a stone’s throw from the two spirit tents for the LGBTQ community. T.J. Running Bear, a 40-year-old mother of two, is a typical example. She and her then-fiancé arrived the first week in August from the Cheyenne River reservation in Eagle Butte, South Dakota, about two and a half hours away. They planned to stay a day. Instead, they ended up getting married at the encampment, and bringing their families. In the process, Running Bear lost a coveted job with the tribal attorney general and sacrificed classes at her tribal college. She stared out at the river. Night was falling and campers were gathering in circles to tell stories, sing, and pray. The cold pushed in. Running Bear smiled and said it would be okay. Her people are used to brutal winters. Note: This article has been updated to reflect the news that the Army Corps of Engineers issued a notice on November 25 informing the Standing Rock Sioux that the Corps will be closing the Oceti Sakowin camp on December 5.